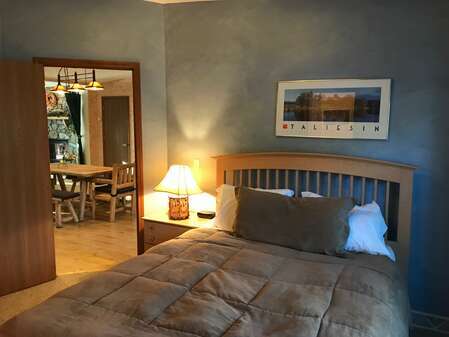 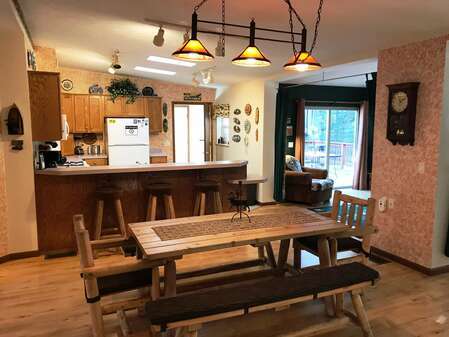 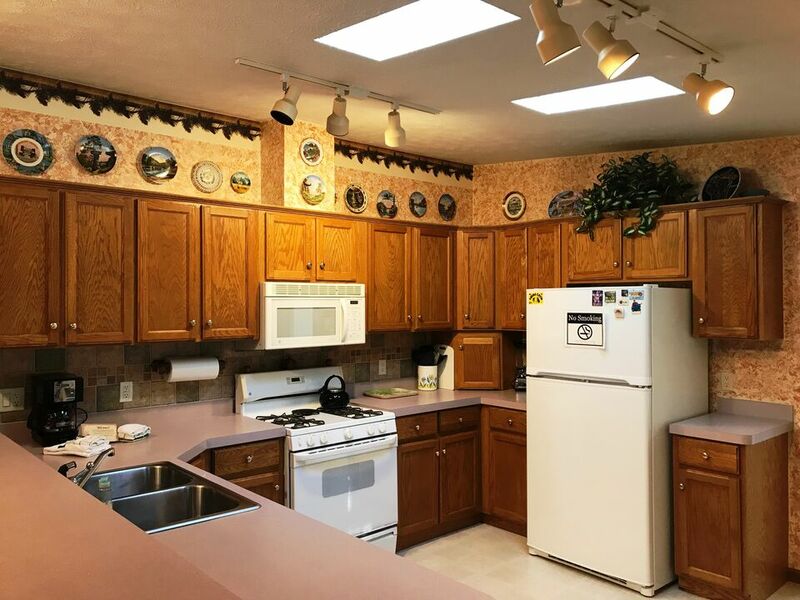 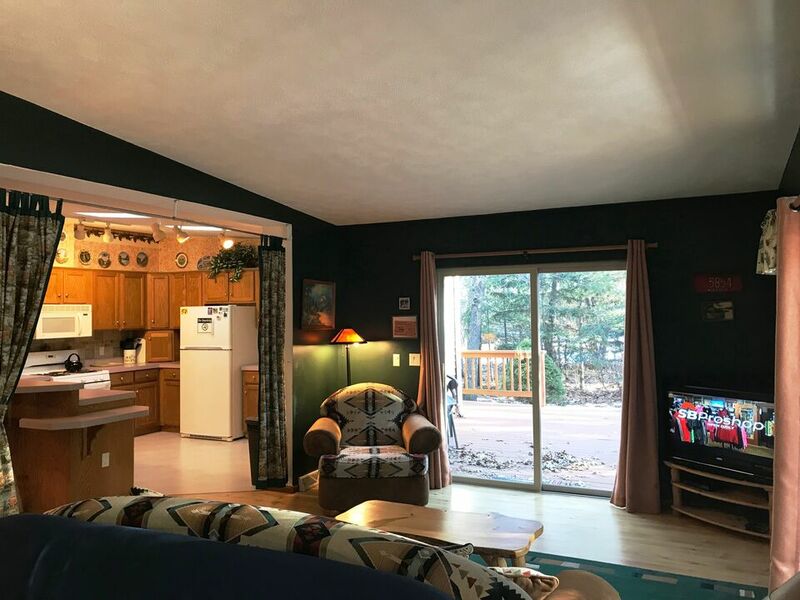 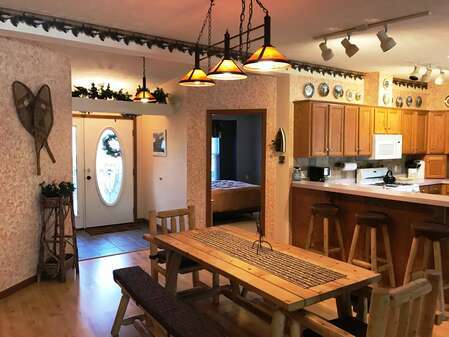 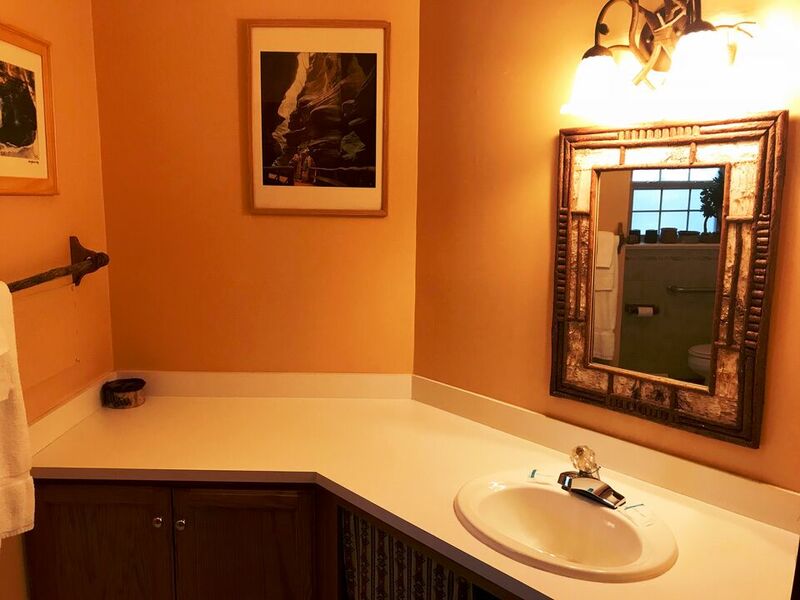 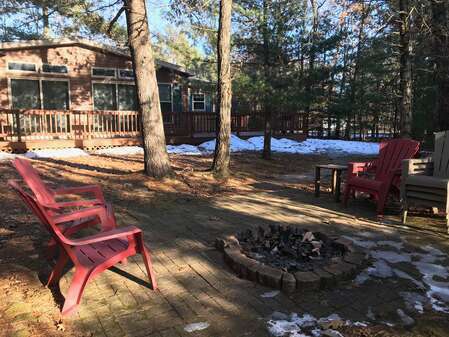 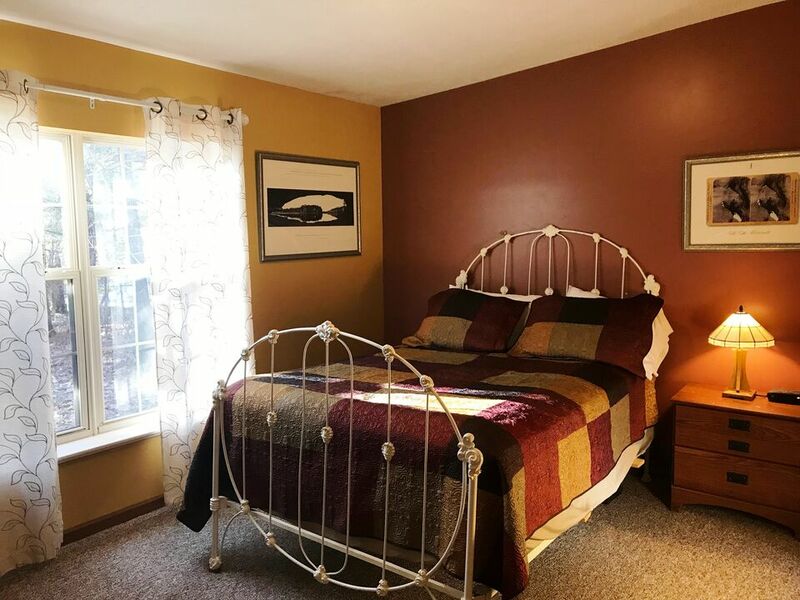 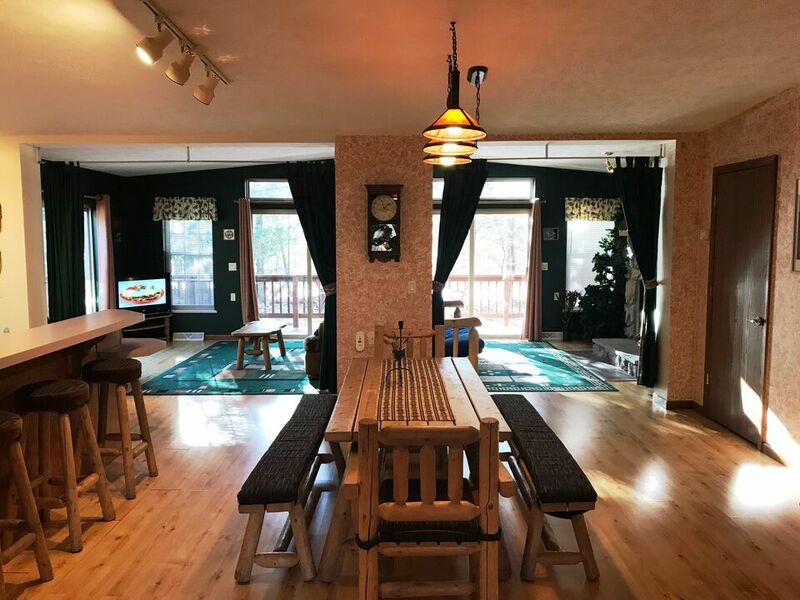 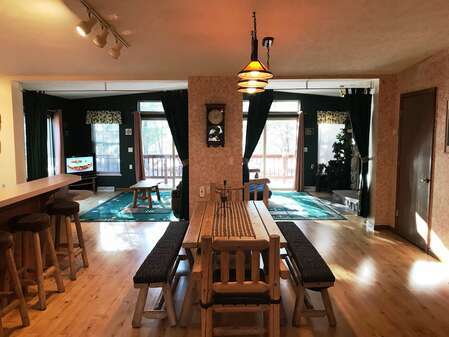 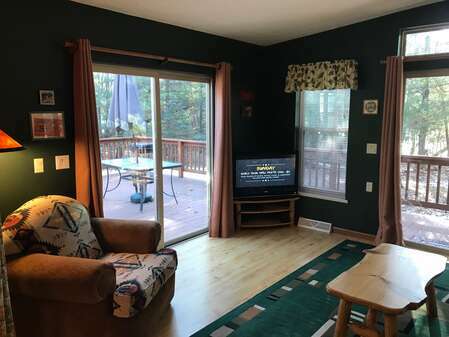 A private tucked away retreat, this ADA certified home is also within a short drive of many Wisconsin Dells attractions including restaurants, the downtown area and water and theme parks. 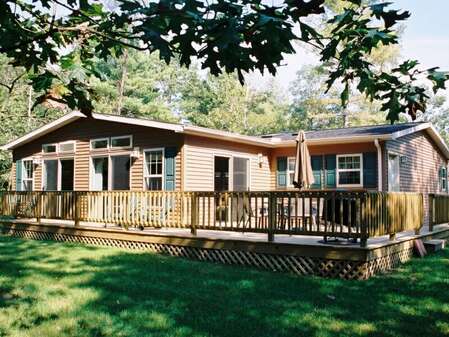 Enjoy the outdoors on the home’s furnished deck featuring a patio table, chairs, charcoal grill and fire pit. 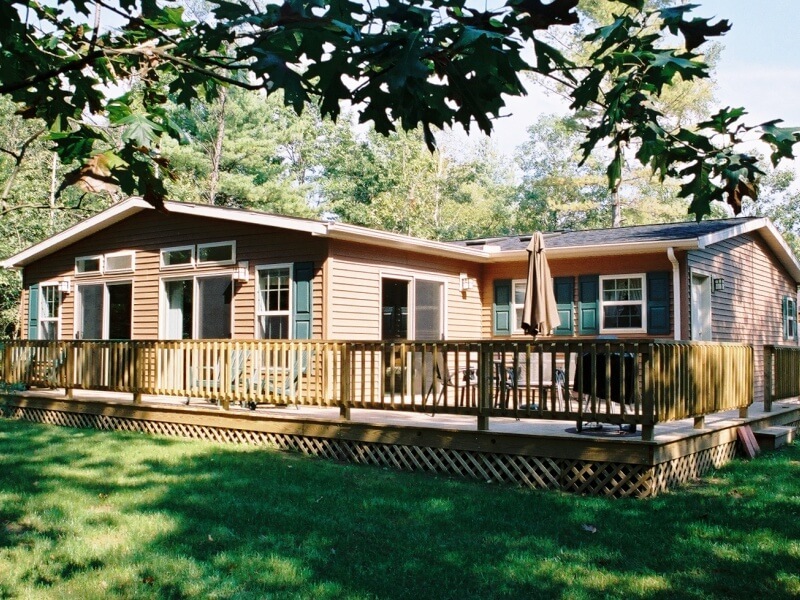 The “Dells” themed Timber Springs sleeps a maximum of 10 people and is the right choice for your next family getaway. Enjoy the peace of three individual bedrooms with privacy and space for you and your guests. 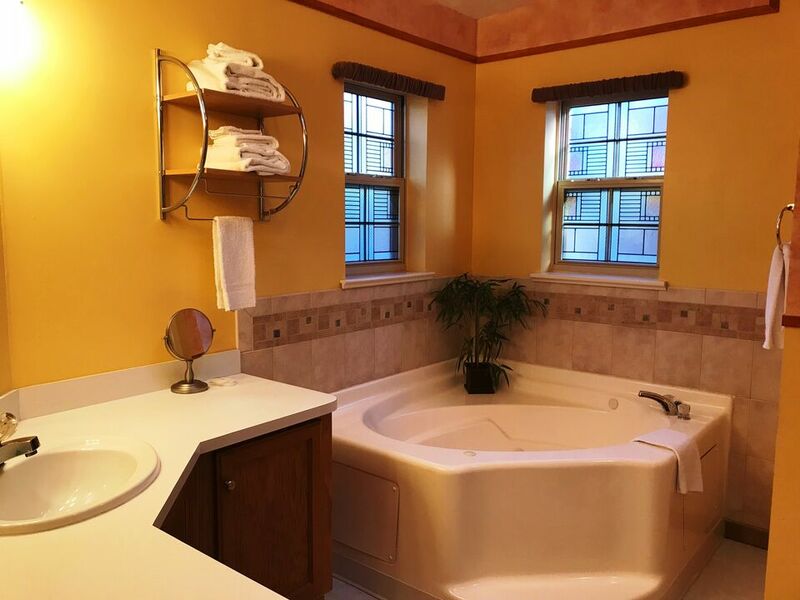 The master bedroom has a queen bed, TV and a private bath with whirlpool tub and shower. 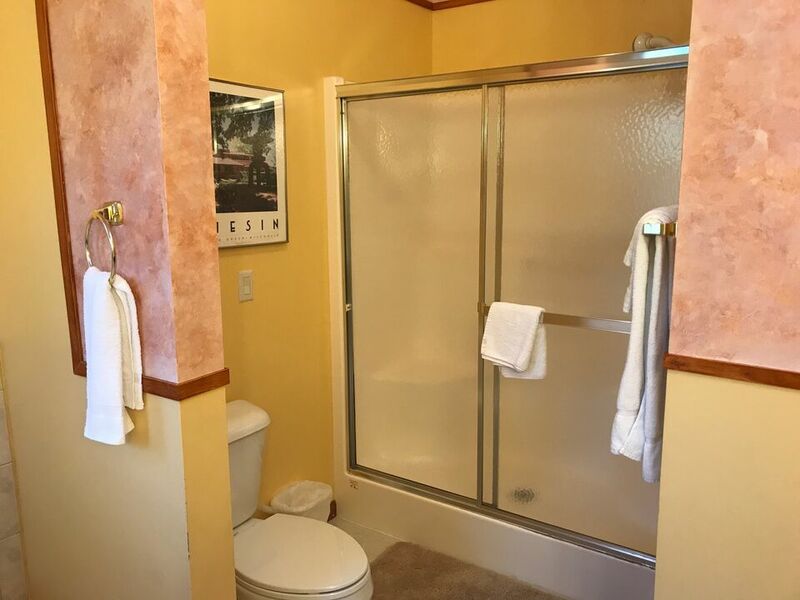 The two additional bedrooms come with TVs and share the second full bathroom - the shower is wheelchair accessible. 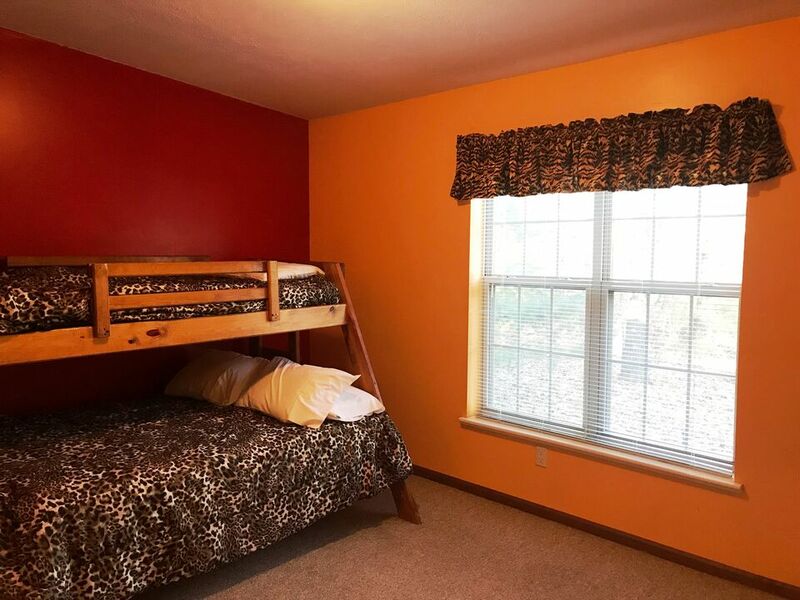 The guest bedrooms are furnished with one queen bed and a bunk bed set (twin over full size mattresses). The full kitchen with dishwasher has a breakfast bar with stools, ample counter and storage space for preparing meals and is adjacent to the dining room equipped with a custom log table. 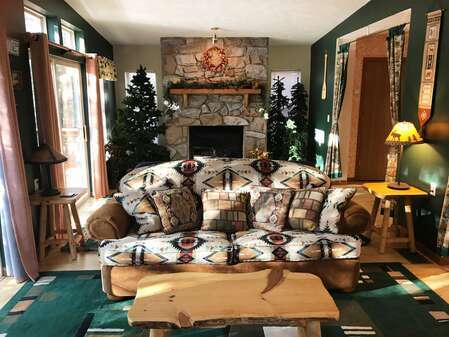 The dining room and kitchen are open to the great room where a gas fireplace, log framed futon and queen sofa sleeper reside. 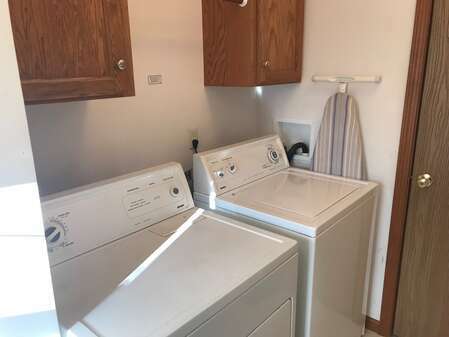 A utility room with washer and dryer add to the conveniences afforded to guests of this home. This is a pet friendly home with a limit of two dogs. Internet access is not provided so don’t forget the playing cards! 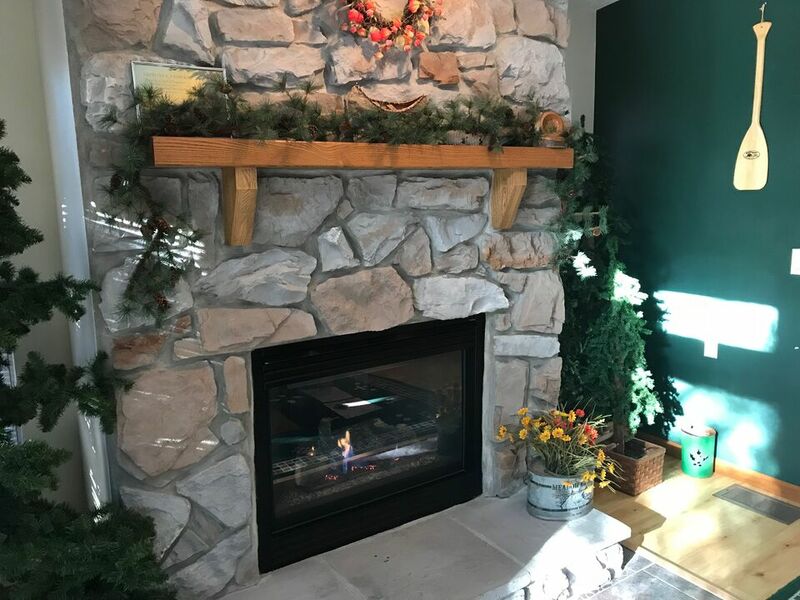 Timber Springs provides access to its own short stone path with picturesque views of various plants and flowers in bloom throughout the summer. 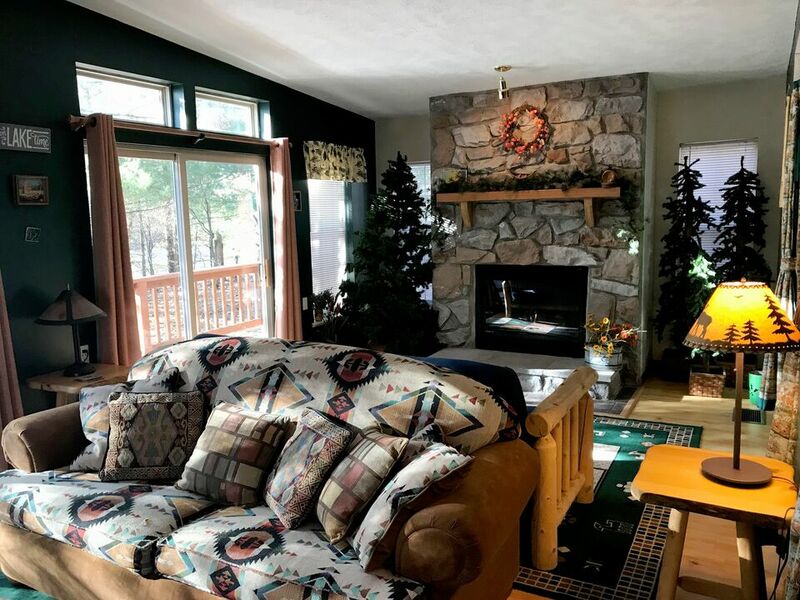 It’s also a short walk or drive to Spring Brook’s Clubhouse, which is home to the Spring Brook Sports Bar & Grill, indoor/outdoor pools, fitness room, golf course and pro shop. Home sleeps maximum of 10, rates based on 6 people over the age of 3. Extra guest fee of $15/night per additional guest applies. 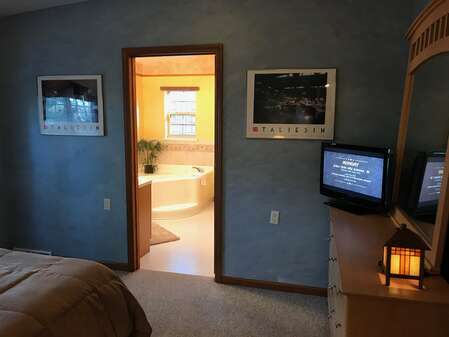 Memorial Day and New Years Eve Holidays require $250 Security Deposit.